FORMER WORLD HEAVYWEIGHT champion David Haye has announced his retirement from boxing. The 37-year-old has called time on his career following a second defeat to Tony Bellew last month in a fifth round stoppage, after previously losing out to his rival in March of last year. Haye admitted after the rematch defeat that he would consider his boxing future, and has now posted a lengthy statement on his official website Hayemaker.com confirming his departure from the sport. He also published a video on his Twitter page, in which he reflected on his time as a boxer. “I’ve had a fantastic run – 27 years in the sport, 16 years as a professional [and] 32 fights. But it’s time to call it a day, it’s time to throw in the towel. It’s time to hang up the gloves and retire as a professional boxer. “It’s a strange thought but it’s a thought I’m very comfortable with as I’ve reviewed my life and my physicality, and it’s not what it needs to be to compete at world level as a heavyweight or a cruiserweight or a middleweight. “The boxing Gods will no longer bless me with that freakish speed of power that I’ve always had since a kid. It’s gone now so it’s time to bow out of the game. I’m happy, healthy and my family are financially secure. It was a job well done, I’ve met many amazing people along the way. He previously announced his retirement in 2011 losing his WBA belt to Wladimir Klitscho in Germany, but made a return to the ring the following year. 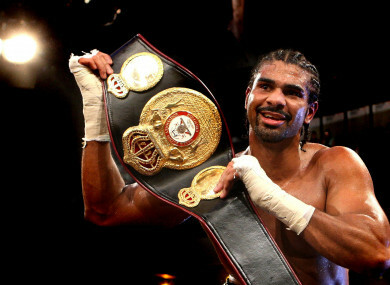 Haye also retires as a former cruiserweight world champion, and finishes with a record of four defeats in 32 fights. “I’d like to thank all my family and friends and team Haye who are my extended family,” he added. “People have come and gone over the years but I’ve loved working with you all no matter how big your part was in my journey. Every piece mattered and I’ve learnt so much over the past few years. “Thank you to the boxing fans, without you checking up online, buying boxing magazines and tickets, there would be no boxing. Keep supporting boxing, it’s the best sport in the world. He concluded by saying that ‘this is not the end of my story, this is simply the start of a new chapter’ and that he is looking forward to doing other things in his life. Email “Former world heavyweight champion David Haye retires from boxing ”. Feedback on “Former world heavyweight champion David Haye retires from boxing ”.